The wife has been busy with the Christmas decorations of late. Came home to find an elf taking a spin on the rotary. 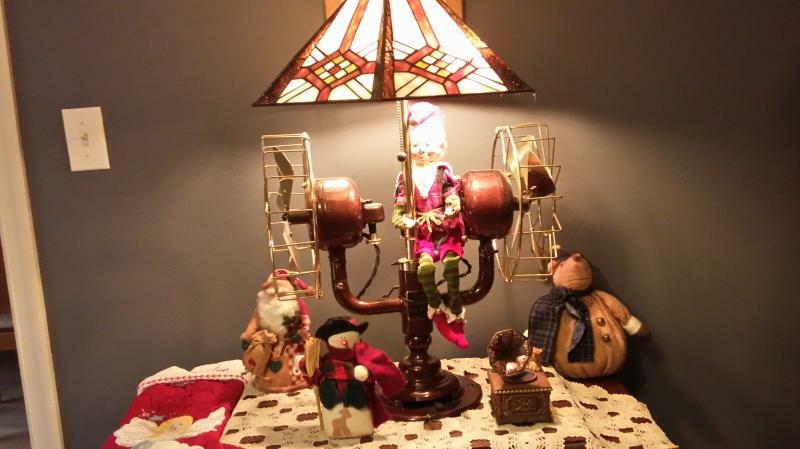 That's a very cool little elf and I love the fan/light. It looks like an Emerson from the base. How did you acquire it? That's a very festive, and fascinating, scene. 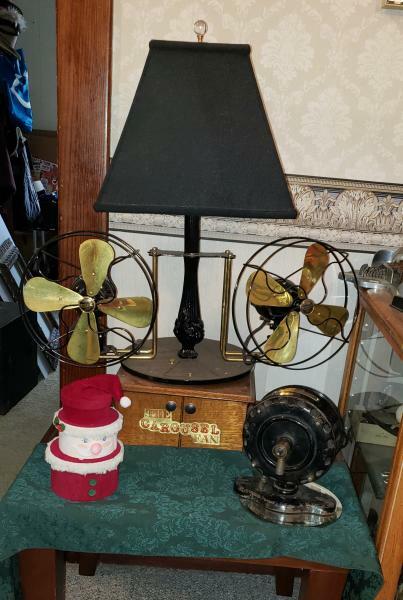 Any further info on that fan? Mr. Dunlap had nothing to do with it. I've been making these rotarys for over 15 years. This is number 33. The fans are Emerson Jr's and the base is Emerson as well. The center bearing column and contact assembly were machined right here at home. This carousel fan made by Bill Dunlap in Hawaii spins round and round too! It is feeling the Christmas spirit too! Ed's creations inspired me to create my own. Hi Edward. That's an awesome fan. I love your creativity and certainly can appreciate the machining which must go into each of them. Hey George, what's that in the bottom right corner, under the carousel fan? 1903-4 GE pancake utility motor... I believe Kim Frank knows the exact year... it is pretty grooooovy!! Page processed in 0.1570 seconds (9% database + 91% PHP). 27 queries executed.